Merck, a leading science and technology company, today announced that the Committee for Medicinal Products for Human Use (CHMP) of the European Medicines Agency (EMA) has issued a positive opinion for approval of Cladribine Tablets (proposed tradename MAVENCLAD[TM]) for the treatment of relapsing forms of multiple sclerosis (RMS) in patients with high disease activity. "The positive opinion from the CHMP is an extraordinary development for Merck, affirming our belief in Cladribine Tablets as a potential important treatment option for patients living with multiple sclerosis," said Belén Garijo, CEO Healthcare and Member of the Executive Board of Merck. "We now eagerly await the European Commission decision, and the opportunity to make a difference in the MS treatment paradigm. Our sincerest thanks to the entire MS community for their unwavering support throughout the Cladribine Tablets journey." 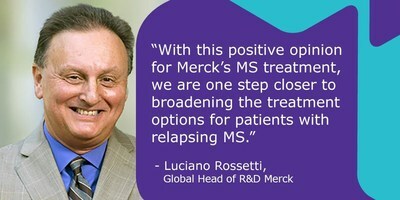 "We strongly believe in the therapeutic value of Cladribine Tablets and the significant impact this investigational therapy may have on the future of MS care," said Luciano Rossetti, Global Head of R&D for the Biopharma business of Merck. 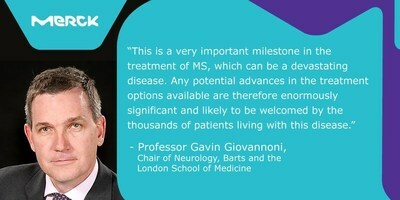 "There are still significant unmet needs for patients with MS, particularly those with high disease activity. We look forward to our continued partnership with the EMA, which has been an invaluable scientific advisor in helping us advance the development of Cladribine Tablets." The CHMP positive opinion is based on more than 10,000 patient years of data with over 2,700 patients included in the clinical trial program, and more than 10 years of observation in some patients. The clinical development program included data from three Phase III trials, CLARITY, CLARITY EXTENSION and ORACLE MS, the Phase II ONWARD study and long-term follow-up data from the 8-year prospective registry, PREMIERE. The efficacy and safety results of these studies allowed a full characterization of the benefit-to-risk profile of Cladribine Tablets. In patients with high disease activity, post hoc analyses of the two-year Phase III CLARITY trial demonstrated that Cladribine Tablets reduced the annualised relapse rate by 67% and the risk of 6-month confirmed EDSS progression by 82% versus placebo. As demonstrated in the Phase III CLARITY EXTENSION study no further Cladribine treatment was required in Years 3 and 4. The comprehensive dataset has informed the posology and monitoring requirements. The most important side effects are lymphopenia, which can be severe and long-lasting, and infections, including herpes zoster. The CHMP's recommendation will be referred to the European Commission which is expected to make a final decision on the marketing authorisation application for Cladribine Tablets within 67 days from the CHMP opinion. MAVENCLAD™ is the proprietary name submitted to EMA for the investigational medicine Cladribine Tablets. MAVENCLAD™ (cladribine tablets) is an investigational short-course oral therapy that selectively and periodically targets lymphocytes thought to be integral to the pathological process of MS. MAVENCLAD is currently under clinical investigation and not yet approved for the treatment for any use in the United States, Canada and Europe. In July 2016, the European Medicines Agency (EMA) accepted for review the Marketing Authorisation Application (MAA) of MAVENCLAD™ for the treatment of relapsing remitting multiple sclerosis. The CLARITY (CLAdRIbine Tablets Treating MS OrallY) study: a two-year Phase III placebo-controlled study designed to evaluate the efficacy and safety of MAVENCLAD as a monotherapy in patients with RRMS. The ORACLE MS (ORAl CLadribine in Early MS) study: a two-year Phase III placebo-controlled study designed to evaluate the efficacy and safety of MAVENCLAD as a monotherapy in patients at risk of developing MS (patients who have experienced a first clinical event suggestive of MS). The ONWARD (Oral Cladribine Added ON To Interferon beta-1a in Patients With Active Relapsing Disease) study: a Phase II placebo-controlled study designed primarily to evaluate the safety and tolerability of adding MAVENCLAD treatment to patients with relapsing forms of MS, who have experienced breakthrough disease while on established interferon-beta therapy. 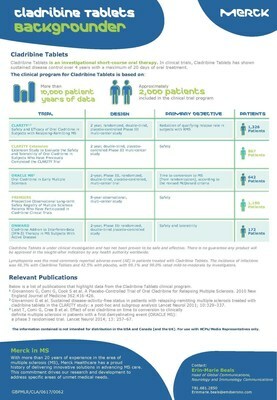 PREMIERE (Prospective Observational Long-term Safety Registry of Multiple Sclerosis Patients Who Have Participated in Cladribine Clinical Studies) study: interim long-term follow-up data from the prospective registry, PREMIERE, to evaluate the safety and efficacy of MAVENCLAD. The follow-up will consist of over 10,000 patient years of exposure in total, with follow-up in some patients exceeding eight years at completion.